A very recent (2013) ’63 Anniversary ES-335 reissue. Close. Real close. But those ears. C’mon, really, that’s the best you can do? First off, sorry for the recent radio silence-I’ve been renovating and moving into my new (actually really, really old) house here in beautiful Litchfield County, Connecticut and haven’t had much time to write. My apologies. It’ll get back to the usual 5 or 6 posts a month pretty soon. Today, I thought I would write about something that I keep getting emails about–folks seem to want my opinion of the newest Gibsons. I usually respond that I haven’t played them and that I’m really a vintage guy. But I wrote about the “Nashville” Custom shop models a while back when I got a couple in trade. 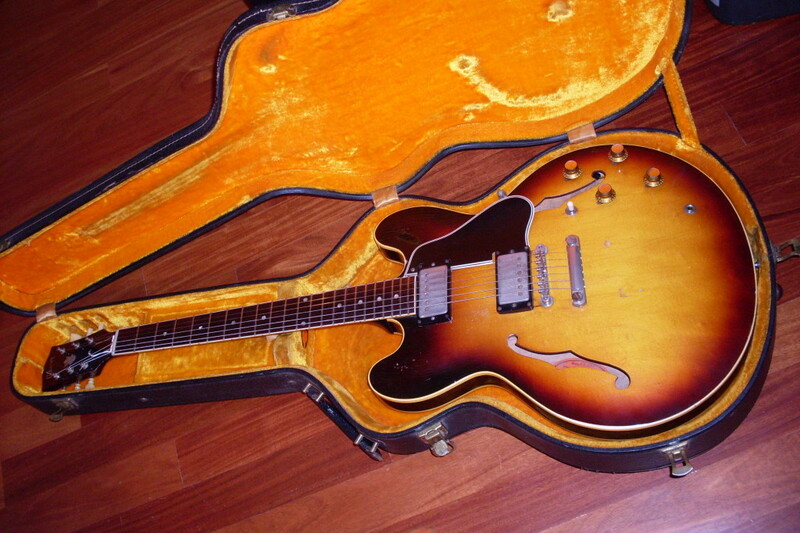 Now I have a ’63 50th Anniversary 335 from the Memphis facility that a lot of folks are saying good things about. It is a 2013 (50 years from 1963 but you knew that). There are things I like and things I don’t like. First and most important is how does it play and how does it sound? The good news is that it feels like the real thing. The neck profile is fairly close, the feel of the finish is right (this is more important than you think) and the frets feel decent as well-a little on the high side but the guitar isn’t 50 years old yet. The frets will have plenty of time to get low. My big gripe about new Gibsons is that they don’t ring out and sustain very well. That could be an age factor-new wood isn’t as dry as old wood and old wood seems to be more acoustically active. More resonant, if you prefer. On the other hand, the quality of the woods might have been better back in the day but, hey, it’s a plywood guitar. How much difference is it going to make. Well, actually, it could make a pretty big difference because so much of the tone comes from the center block and the neck. In the past, these guitars felt kind of heavy and that may also have been related to the wood. Most 50’s and early 60’s 335’s weigh in around or slightly below 7.5 lbs. Some hit 8 lbs but most don’t. Don’t count 345’s and 355’s-Bigsby’s and Varitone chokes are heavy. The ’63 Anniversary I have in my hands weighs 7 lbs 6 ounces which is what it should weigh and very comfortable for an old dude like me. This guitar sounds pretty darn good too. Lots of bite in the bridge pickup (a Burstbucker) and no mud in the neck (also a Burstbucker). Nicely balance and the middle three way position doesn’t sound almost exactly like the bridge pickup which I’ve found in a lot of modern 335s-it’s actually a pretty useful tone. So what don’t I like? Well, it sure doesn’t look like a 63. They made the ears pointy but they are way wrong. There was a later iteration of the pointy ears that you saw in 67 and on a lot of Trini’s. Some folks call them “fox ears”. They are short and pointy and kind of stumpy looking. That’s more what these look like. It’s strange that Gibson got the Clapton reissue almost dead on and they couldn’t nail this one. The rumor is that the Clapton bodies were made in Japan where they know how to copy stuff. Next, the neck heel is way too big-how tough would it be to get this right? Really. The knobs are way off and the pickup covers are too. These are easy to change if you’re so inclined but, again, you’d think they could source accurate parts. I can source accurate parts, so I don’t see why Gibson can’t. Lots of great repro stuff out there. For some reason the three way switch tip is black and the owner of this guitar insists that’s how it came from the Gibson dealer. And how about correct vintage length stop tail studs? These are the short ones. I hear the Nashville ones that you pay a couple thousand more for have the long ones. I haven’t checked recently. They’ve finally gotten the bindings better but the headstock inlay (the crown/flowerpot) is a bit odd. These are kind of nitpicks I suppose but it would be so easy to fix them. Fit and finish, by the way, are excellent. I had a Memphis “fat neck” back in 2009, I think, that looked like it was routed with a chain saw. These new ones are smooth and clean inside. Nicely done. The important thing is that they are sounding and playing pretty well and if they can keep the price from going up every year, they just might make sense for a lot of buyers who were hoping to find vintage in that $3000 range. Myself, I’d still take an 81-85 over this guitar but not because they sound any better. Only ‘cuz they’re old and I like old. This is a real one. Do those ears look the same to you? They sure don’t to me. These are longer and they stand up straighter. And the knobs. How tough can it be to copy the real ones?? This ’64 was kind of a beater to begin with but you can see what happens when the board is planed and the binding is planed with it. The dots wind up at the top of the binding. Don’t freak out. 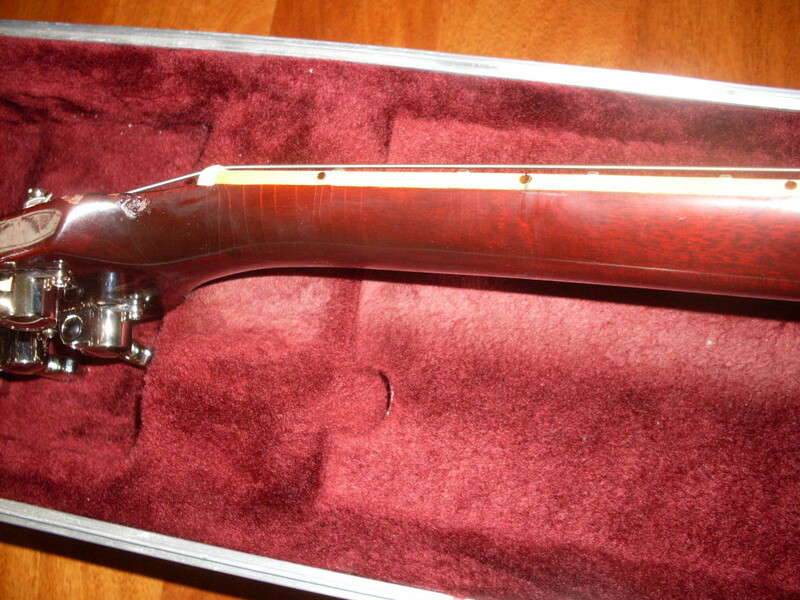 The neck on your vintage Gibson may change shape on its own. I think the thing vintage buyers worry about most is the neck-especially on set neck guitars like 335s. Wood is not a particularly stable material. It expands and contracts with the weather, it is certainly subject to the forces of gravity and it breaks when stressed. The lack of stability can also be a good thing, I suppose. But, as I’ve mentioned about a zillion times in the past, 50 or 60 years is a very long time and bad stuff can happen. The heat goes out while you’re off skiing in Kitzbühel and your guitars are at home. Or maybe somebody forgets to take the guitar out of the back of the car after an overly arduous gig in July and remembers the next afternoon when he’s finally over that hangover. And it’s 200 degrees in there because it’s Phoenix in July. Fifty years is 19,150 days. It only takes one day of bad luck to mess up the neck on a vintage guitar. That good thing about wood being unstable? You can fix almost anything that happens to a guitar neck. Sometimes it’s just a truss rod adjustment. Sometimes a fret level will do it. More severe issues require more severe (and invasive) procedures but there is almost always a way to fix it. As a dealer, I try to avoid guitars with neck issues. I’ve written about some of the troubles I’ve had with 61’s and truss rod cracks and back bows. The less wood there is in the neck, the less stable it’s going to be. But what happens to the value of the guitar when neck work is required? Well, an unplayable guitar isn’t going to make anyone happy, so from the get go, any improvement will be, uh, an improvement. A wise man once told me that you play the frets and not the fretboard so that if the frets are level, a bit of unevenness in the fingerboard won’t be a problem. The “off ramp” problem where the fingerboard rises a bit where it meets the body is usually taken care of with a simple fret level. A rise in the middle of the fingerboard can sometimes be adjusted out using the truss but it depends largely on where the hump is. The truss seems to do the most toward the middle of the neck-simple physics tells me that. A hump in the lower frets can be tricky. Sometimes a fret level will fix that too. Some luthiers (and I stress, I’m not a luthier) have had success with steaming the neck and, essentially, bending it back into straightness. Seems kind of scary to me but I know of folks who swear by the process. Another approach that is used frequently and is very effective is reshaping the neck by sanding or planing. The problem with this procedure is that most luthiers sand or plane the fingerboard and the bindings until the hump or dip is gone. It works but it can be very obvious-worst case, I suppose, is when the bindings get so thin that the side markers end up at the top of the binding instead of in the middle where they belong. I suppose, from a non luthier’s point of view, it would make more sense to remove both the binding and the fingerboard and plane the neck itself. I’m guessing that doing that would have its own set of consequences. The piece of mahogany that is the neck doesn’t know that its warped or bent or twisted. Its simply taking on a shape that is dictated by the conditions to which it is subjected. Once returned to its straight and true shape, it should be fine for another fifty years. 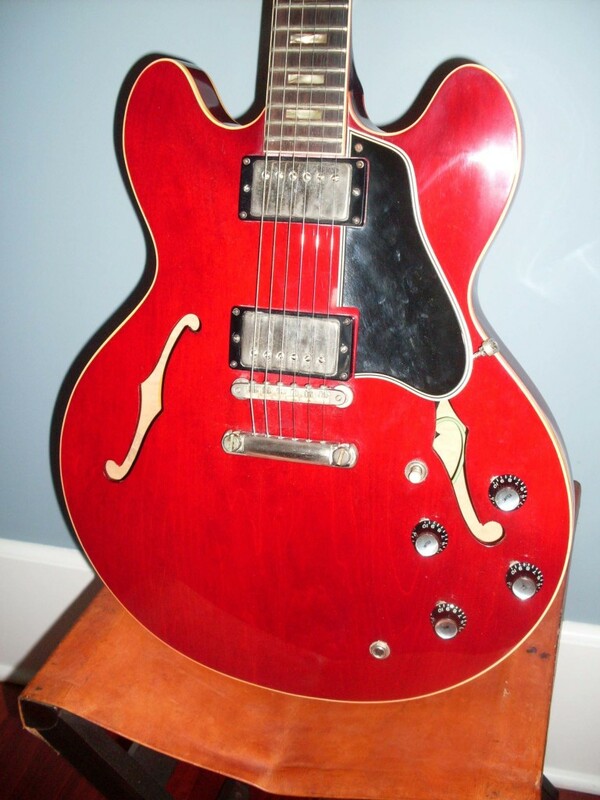 What I really need to stress is that most vintage Gibsons don’t have perfect necks. In fact, based on my experience, about 20% of them have perfect necks. Perhaps another 75% have necks that function perfectly but have some small issue that won’t affect playability for most players. A buzz at the 21st fret won’t bother someone who never plays up there. These issues simply come with the territory. While I try to disclose each and every quirk or hump or dip or high fret or low fret in every guitar I sell, sometimes I simply don’t notice it. I rely more on my ears than my eyes. If the guitar plays well and doesn’t buzz or fret out, then I don’t worry too much about whether its dead straight because the likelihood is that it isn’t. I might mention that it will play better with a bit of relief-so it shouldn’t be dead straight to begin with. I also might reiterate that it’s fixable. This 61 dot neck had terrible neck issues including a break so drastic action was taken and the result was brilliant. The luthier made a new neck using the original board, dot markers and truss rod. Only the neck itself was changed. It was a $4000 repair but a big 59 sized neck was installed and the guitar was pretty amazing. There are no lost causes. Nice TDN but not the neatest paint around the f-holes. It’s really common on early 335’s. Didja ever notice how crappy the paint around the f-holes is on a 335? Particularly on the early ones? There’s a reason for this and it isn’t because everybody’s hung over on certain days, although I’m sure there was some bad paint that could be attributed to that particularly common malady. 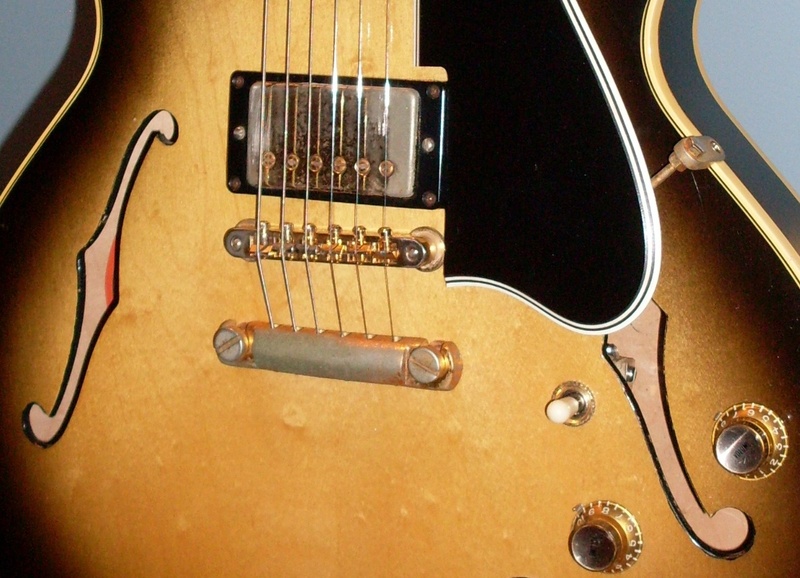 If you look at an early 335 with the bridge pickup out of it, you will see that there is no cut in the center block to facilitate the installation of the harness. Stereo guitars and most mono 355’s have a big chunk cut out of the center block which makes the harness go in relatively easily. Note, I said relatively. It still isn’t easy to get that Varitone switch into place nor is it easy with those big shielding cans over the pots. Don’t try this at home if you can possibly help it. 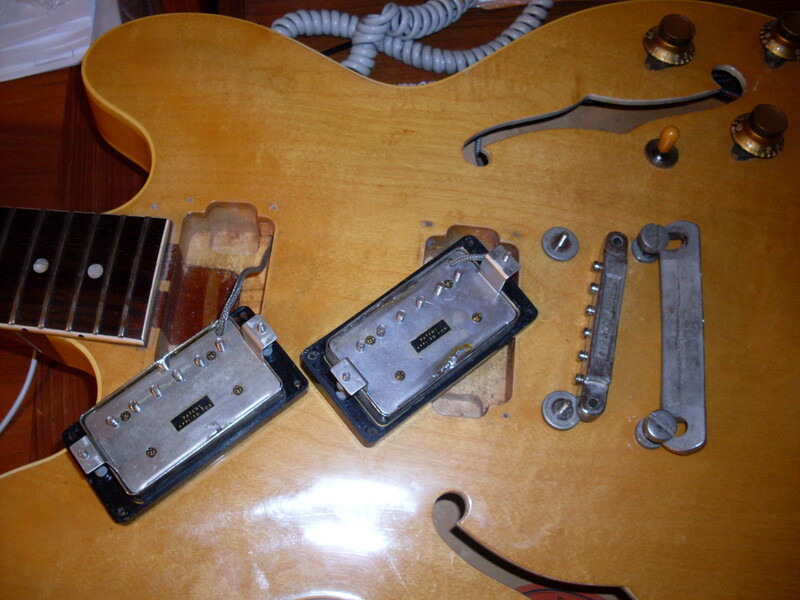 The reason that so many early 335s have crappy paint around the f-holes is because the folks who installed the harnesses had to stuff them in through the f-holes. I’ve done it dozens of times and while there is a trick to doing it cleanly, it is still a somewhat fiddly procedure. So, what happens is the paint gets scraped off the edges of the f-holes by the harness installation people. On a sunburst, you’ll see that the paint around the f-holes is a medium brown. The red 335’s get a fairly well matched red and the blondes get white. I’m told that the harness ladies (it was mostly women-I don’t know why although I could wager a sexist guess) kept a pot of paint (to two or three) at their station for the express purpose of touching up the scrapes and abrasions caused by this process. But that’s not the whole story because there are 345’s with terribly sloppy paint too and no harnesses went through the f-holes. I don’t have a logical reason for this and would appreciate any insight anyone might have. The photo at the bottom of the post is one of the worst I’ve seen. Note that the paint on that one is black. That’s because it isn’t your usual sunburst. It’s called Argentine Grey. The 335’s eventually got the cutout in the center block and the problem largely went away but the f-hole edges continued to have the same slightly off color paint around the f-holes. Strangely, the cutout was an unusually long transitional element for Gibson. The earliest 335 I’ve seen with the cutout was a 61 but for those of you who remember the stop tail ’65 I called “The Mexican” (because I bought it from a guy in Guadalajara), it had an uncut block. That’s a four year transition which seems kind of long. 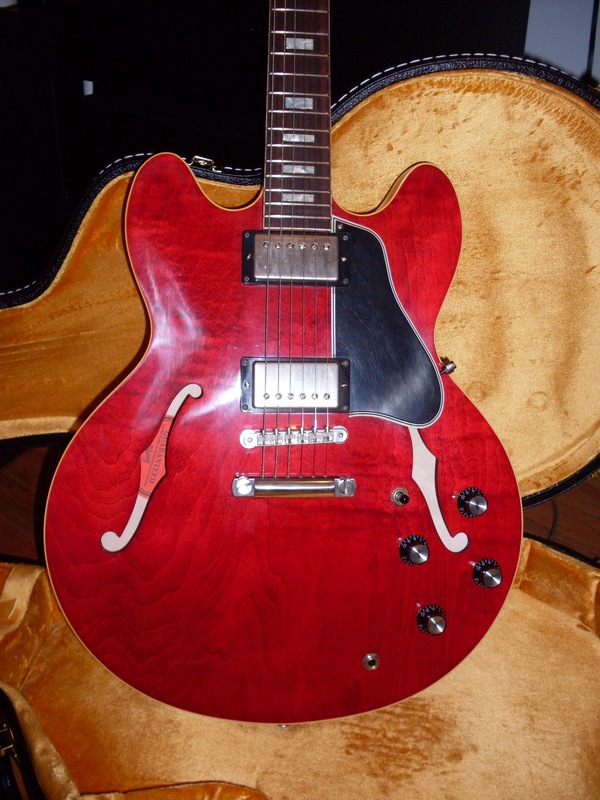 By early 65, all of the 335’s had the cut block. I’ve had folks question the originality of the finish on a guitar because the paint around the f-holes looked so amateurish. Don’t. The harness ladies were paid to stuff harnesses into guitars, not paint them. They were probably paid somewhere around the minimum wage to do a job that none of us guys would want. Go ahead, try stuffing a harness in through the f-holes. And don’t do it on a 68 or later-the f-holes are bigger. And make sure you have a pot of paint available. Not the cleanest paint job. Oddly, it is a 345 and it’s sloppy on both f-holes. This proves my theory half wrong. That’s an Argentine Grey 345.